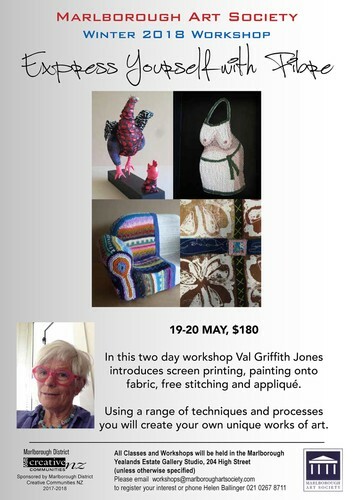 A Winter Workshop taken by Val Griffiths Jones who will introduce screen printing, painting onto fabric, free stitching, and appliqué. Using a range of techniques and processes you will create your own unique works of art. Phone Helen Ballinger 021 02678711 for more information or to register your interest. Cost per person for this two day workshop is $180. Sponsored by Creative Communities.